The Second World War Memorial in the King's Own Royal Regiment Chapel, Lancaster Priory Church. Near the altar on the right is a bronze casket containing the Rolls of Honour for the First and Second World Wars. This memorial is dedicated to 20 year old 2nd Lieutenant Christopher John Hodgson who was killed in action on 22nd May 1941 at Falluja in Iraq. The Memorial takes the form of a metal bound oak casket, with a curved glass top, through which can be seen the Rolls of Honour for the Great War 1914-1918 and the World War 1939-45. The casket rests on a stone base which is placed before the chancel steps of the Regimental Chapel and in front of the pews on the south side. The base of the memorial is made from two massive blocks of stone, cut from one piece, carefully chosen for the purpose while still a part of the rock face of a quarry at Longridge. The fine rugged nature of this stone, with its coarse grain, is very similar to that used in the oldest parts of the Parish Church. The King’s Own Royal Regiment. Born in the 2nd Battalion, in Burma 1920. Killed in Action 1st Battalion in Irak 1941.
Who Gave Their Lives In War 1914-18 and 1939-45. 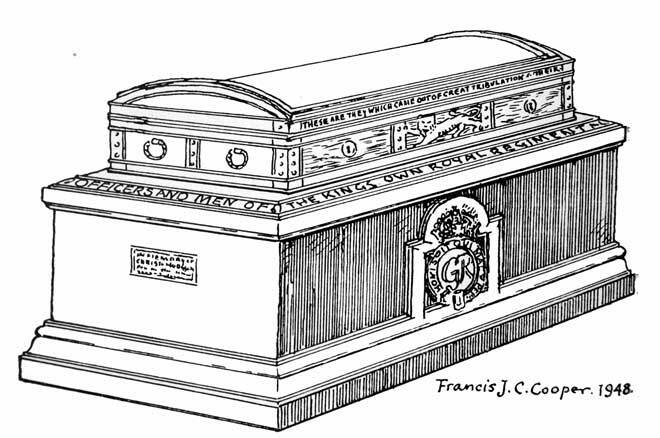 The casket itself, with its glazed lid, contains a raised and slightly sloping panel on which the books rest. It is made from Sussex oak renowned for its quality. The design of the memorial by Francis J C Cooper has evolved from another memorial in Winchester Cathedral, made for the King’s Royal Rifle Corps by the designers late father, J. Paul Cooper, an Artist and Silversmith who lived and worked in Kent. The King’s Own Memorial has grown into a reality, with the help of a small band of skilled craftsmen, who have co-operated in its execution. The oldest of these is A E Newton, cabinet maker, who made the casket; and the youngest Harry Fecitt, mason and stone carver, now working in Ambleside, after serving in the King’s Own during the war. The Westmorland green slate and final touches to the Royal Cypher were his work, while the rest of the Stone work was done by his brother and assistants, Messrs. Fecitt Brothers, at Blackburn. The metal work was carried out by R L Simmonds with the help of his brother, E Simmonds; and the chased badge was executed by B J Colson. The Rolls of Honour for both the First and Second World Wars were the work of Graily Hewitt with the valued assistance of Ida Henstock. The rolls are similar in decoration and all other respects and are on pages of lambskin. The names are written evenly in black, with initials of Christian names. In the few cases in which rank, name and initials are the same, the regimental numbers are added. The ranks are given in red in rather a smaller hand, distinctions appended in gold. The hand is taken from the style of the Italian fifteenth century. There are usually fifty names to a page, written in double column, the arrangement alphabetical in two lists, one for officers, the others for all other ranks. All the pages are decorated with ornament in gold and colours down the margins of the pages and between the columns of names. Ornamental paragraph-marks are introduced at the first letter of the alphabet in each case, to allow of decoration retaining continuity throughout all pages. The title page is bordered by a conventionalized tree growth of the Rose of Lancaster, and among the roses appear scrolls bearing the names of the theatres of war in which the various units of the Regiment were engaged, while to add richness and variety a subordinate growth of finer filigree is displayed with forms of birds introduced for interest and liveliness. At the top of this page is set the Lion of England and, below, the Royal Cipher within the Garter. It was the duty of a soldier from the Regimental Depot and later from the Territorial Army Battalion to turn the page of the Roll every Sunday. 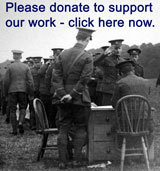 This duty is now performed on the first Sunday of each month by a member of the Regimental Association.